The current flowing from the cathodic protection system to the propeller shaft emits an underwater extremely low frequency electric (ELFE) field. Find out how Davis uses computer modeling to determine the nature and magnitude of your ship's ELFE signature and what you can do to minimize it. 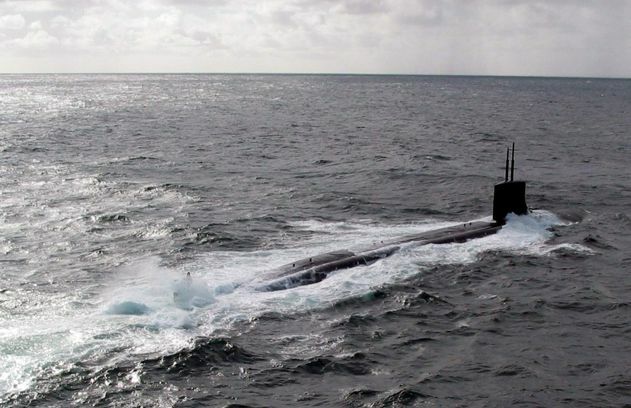 Davis can be contracted to predict the underwater electric and electromagnetic signatures which result from the current flow from the cathodic protection anodes to the propeller shaft of a surface vessel or submarine. • Understanding the susceptibility of a vessel to influence mines. The studies take into account the following geometric and environmental factors. • Locations of active or passive protective anodes across the hull of the vessel. • Degradation of anodic protection systems due to passive grounding deterioration and coating holidays. • Varying salinity from seawater to brackish to freshwater environments. • Varying mine sensor locations and varying vessel depth from surface to periscope depth to fully submerged. The Davis software program, ShipEM, provides signature information which is crucial for designing ships and submarines. ShipEM is based on the Weaver dipole model which calculates the underwater electric and magnetic fields around a ship based on its dipole currents and geometry. 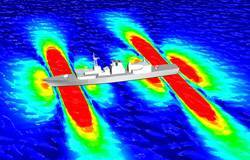 Knowledge of these electromagnetic fields allows the ship designer to minimize signature and susceptibility to influence mines. ShipEM is composed of a front-end to simplify the input of ship model data, the Weaver calculation engine, and a back-end to combine the results of multiple dipoles from a ship and provide graphical output. It provides a three-dimensional view of the magnitudes of the electric and magnetic fields in the water around the ship.